There are two ways you can add Search Engine Optimization (SEO) information to your Galleries: through the Redframe Site Editor, or through Manage Your Galleries. Navigate to the Gallery you want to edit, the click Edit Gallery in the Menu Bar. 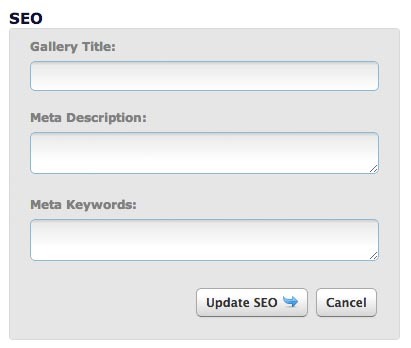 Under the Edit SEO Options area, click the Edit Gallery SEO button. Scroll down to the Gallery you want to change, the click the Edit button to open the Gallery Settings Editor. Gallery Title: give your Gallery a more descriptive title than what appears in your Navigation Menu. This information will appear in the <TITLE> tag of your Gallery and will be used for Social Media Sharing. Meta Description: A brief description of your Gallery. This will appear in search engine results for your Gallery and will be used for Social Media Sharing. Meta Keywords: A comma-separated list of keywords related to your Gallery contents. This is used by search engines to match search terms with your Gallery. When you have finished entering your SEO Title, Meta Description, and Meta Keywords, click the Update SEO button to apply your changes. For more information about how SEO works on your Redframe website, please read Important info about SEO and your Redframe website.